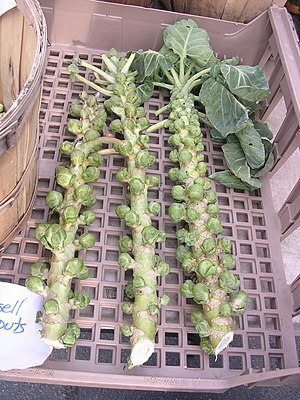 Brussels sprouts, much like beets and okra, are often maligned as vegetables. Well, perhaps vegetables are maligned in general, but this trio is, specifically. Nevertheless, they are consistently favorites of mine. The Brussel sprout is particularly peculiar, especially when one sees them sold by the stalk for the first time. The Brussel sprout is but a cultivar of it wild counterpart, the cabbage, and is grown for its edible, miniature cabbage-like buds. 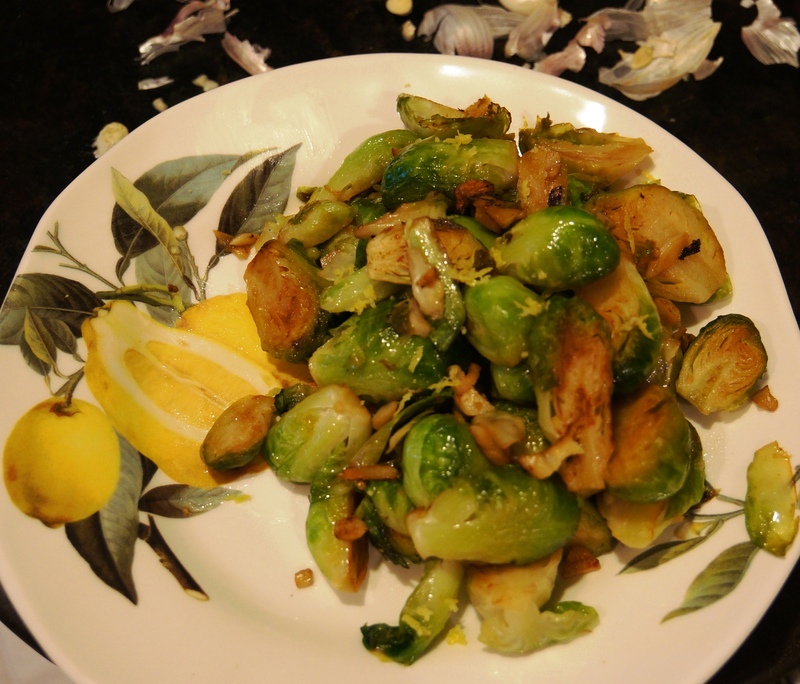 Brussel sprouts and garlic slices in a large skillet. I first learned to take Brussel sprouts from the traditional salt boil with butter to a sautéed version from a former friend. And yes, there is a story there. Adding lemon juice, however, was the Brussel sprout talking. And the Brussel sprout knows best. Brussel sprouts, trimmed of stems and outer leaves, with garlic cloves. Directions: Rinse and trim stems and outer leaves of Brussel sprouts. Cut in half. Peel and slice several cloves of garlic. 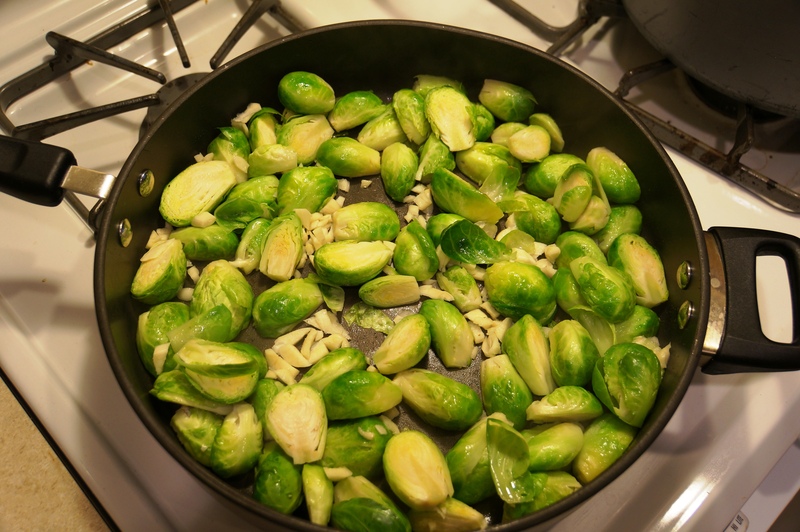 Add two tablespoons of olive oil to a large skillet along with the halved Brussel sprouts. Toss sprouts with oil. Add 1/4 cup water, 1 tsp. Kosher salt, 1 Tbs. lemon juice, and 1 tsp. lemon zest. Cover and cook on high heat five minutes. After five minutes, remove lid and stir sprouts which will have begun to brown. Add two tablespoons butter (or more olive oil) and cook uncovered, face down, for an additional five minutes. Transfer to serving plate and top with fresh zest. Squeeze fresh juice oer top and serve. Add a wedge of lemon for garnish and additional flavor! If my seventeen year old son thinks these sprouts are the perfect accompaniment for turkey breast, twice-baked potatoes, and gravy, don’t you think they could find favor in your next meal? Brussels with garlic and lemon. Brussels sprouts as we now know them were grown possibly as early as the 13th century in what is now Belgium.The first written reference dates to 1587. During the 16th century, they enjoyed a popularity in the southern Netherlands that eventually spread throughout the cooler parts of Northern Europe. The edible sprouts grow like buds in helical patterns along the side of long thick stalks of approximately 60 to 120 cm (24 to 47 in) in height. They contain good amounts of vitamin A, vitamin C, folic acid and dietary fibre. Moreover, they are believed to protect against colon cancer, because they contain sinigrin. The largest producers are the Netherlands, at 82,000 metric tons, and Germany, at 10,000 tons. The United Kingdon has production comparable to that of the Netherlands, but it is not generally exported. Production of Brussels sprouts in the United States began in the 18th century, when French Settlers brought them to Louisiana. Thomas Jefferson grew them at Monticello. The first plantings in California began in the 1920s, with significant production beginning in the 1940s. Most of the United States production is in California,with a smaller percentage of the crop grown in Skagit Valley, Washington, where cool springs, mild summers and rich soil abounds.